With few exceptions, software development work has long been separate from other parts of the organizations it supports. The rest of the organization did not understand software and too often, the development organization was not tightly attuned to the business of the rest of the company. Difficulty communicating on the one hand led far too often to building the wrong thing, or at best, not quite the right thing and on the other hand, led to wasteful management and governance practices. Agile approaches have helped here by enabling rapid feedback cycles to correct mistakes before there is no budget left to do so. We need an approach that engages development organizations as full partners with other disciplines in creating delighted customers which leads to business success. Joint engagement needs to be based on efficient and effective communication, but the disparate perspectives and even vocabularies dominating each discipline make unambiguous communication difficult. What is needed is a way to visualize the problem we are collaborating to solve in a way that allows people contributing from their individual discipline’s perspectives to be talking about the same thing. Agile approaches use ‘working software’ as this visualization by rapidly implementing small collections of user stories which non-software disciplines can provide feedback on. However, while working software can validate choices, it does not help a lot with discovering and selecting those sets of user stories whose implementation will delight the people who will use the solution to achieve the overall purpose. Many of the barriers to effective collaboration arise from unshared, unexamined, unproved assumptions. Each discipline has different sets of assumptions. If these can be made explicit and examined and validated, it will be possible to get to better solutions faster. This is exactly where impact maps are helpful as they lay out visually the WHY, WHO, HOW and WHAT of the problem we are confronting. Like highway maps that show towns and cities and the roads connecting them, impact maps lay out what we will build and how these are connected to ways we will assist the people who will use the solution. The primary purpose of a highway roadmap is not to provide detailed information about the towns and cities but rather to make explicit the connections among them; their secondary purpose is to help us identify alternate routes. Discussions about the nodes of the impact maps and the assumptions which connect them can effectively engage all the disciplines in discovering innovative, efficient solutions. They provide an explicit context for making decisions and exposing uncertainty, which can then be addressed by doing experiments. Like closed roads or roads under construction, sometimes assumptions are not viable or are simply wrong. It is called a highway map, not a destination map. What your map is really assisting with is visualizing first provable and later validated assumptions (roads). We are seeing fundamental shifts in mind-sets from push to pull and correspondingly a shift from directive control to adaptive control. Push means people need to be told what to do; pull starts with a problem or opportunity and challenges a cross-disciplinary group to effectively understand and address the issues. This is a fundamental shift from a focus on ‘manufacturing‘ what a customer orders to a focus on collaborating with other parties to achieve a purpose. This requires a shift from extrinsic motivation (push) to intrinsic (self) motivation (pull), and as Dan Pink so elegantly explains, intrinsic motivation is driven by autonomy, mastery, and purpose. An autonomous group which collectively includes competence in the requisite disciplines is the only effective way to efficiently achieve the kinds of goals we attempt to achieve today. However, groups are not effective teams unless they have a shared target or goal. Shared goals arise from shared stories. Storytelling, or more deeply, shared story creation or discovery is what is going on here. An impact map is also a storyboard of our conceptual understanding of how to address a goal or target. This is too important to be left to a ‘customer’ or ‘product owner’ to push upon the team. The impact map approach helps you to focus on understanding and evolving a response to even ‘wicked problems’ which increasingly are what we confront these days. This book advocates relentless re-visitation of every element and validation of assumptions, which seems exactly what we need today. Even the initially selected impact or effect or goal or purpose is based on assumptions about the situation of the organization and the market, so it needs to be validated along with all the steps to address it. Design is about finding and trying possible solutions that might cause the desired impact. The critical component is neither the cause nor the effect but rather proving the validity of the assumption that links them. Assumptions validated by consistent data from actual experiments enable the creation of real value. 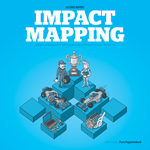 An impact map connects candidate causes with desired effects. It is a map of assumptions connecting causes and effects. It helps you to find the right questions, which is much more difficult than finding good answers.